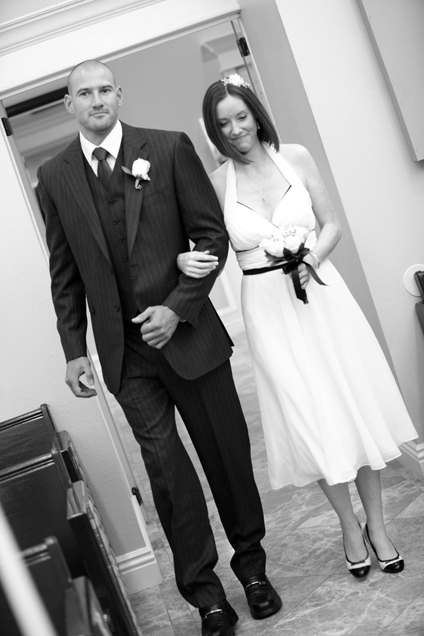 Kate and James travelled from Derby in the United Kingdom to get married in Las Vegas. James had been in the same class as Kate’s older sister at school so they had known of each other for many years before they met properly through friends as adults. They began dating in 2003 and got married just over eight years later. They got married just five months after having got James popped the questions as a surprise to Kate on Christmas Day. They had been trying to conceive a child and wanted to get married before starting a family. James had always wanted to get married abroad so their first thought was to get married at Lake Garda in Italy. It is a special place to the couples because James had surprised Kate with a holiday there some years previously. It turned out that they would have had to wait over a year to get married there, and, like so many Las Vegas couples before them, they were in a hurry. They had visited Las Vegas before and loved it, so they decided to go with Vegas for their wedding locations. It suited them, because they were eager to get rings on their fingers so that they could start a family. They had noticed the Chapel of the Flowers on their previous trip to Las Vegas, they both remembered liking the look of it, so there was no competition for them, they went straight to them. They were completely happy with the chapel and would highly recommend it. Their visit was a quick one, they flew in on the Saturday, got married the Wednesday and flew home the following Saturday. They stayed at the MGM Signature. Kate said “I would recommend staying at the Signature if you wanted to get away from the hustle and bustle of the Strip but still be close enough to it.” While they were in Las Vegas they spent plenty of time in the casinos but also managed to visit the Hoover Dam and the Valley of Fire. 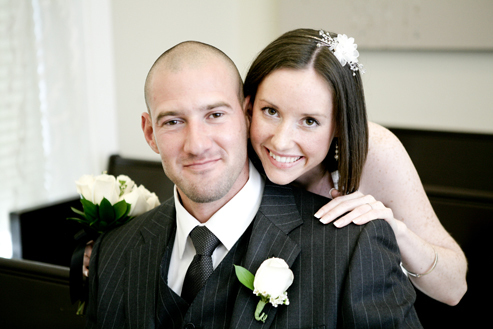 As many eloping couples do, they felt guilty about having their wedding ceremony without guests. They felt bad that their family could not share the experience with them in person, but they were able to watch it live via webcam. That helped to soften the blow. Kate said that their families were disappointed but understood that they wanted to elope to Vegas for their wedding. Kate did her own hair and makeup and wore a white halter neck, knee length dress, bought from Coast back in the UK. She had a simple dozen white rose bouquet tied with black ribbon to match the sash on her dress. 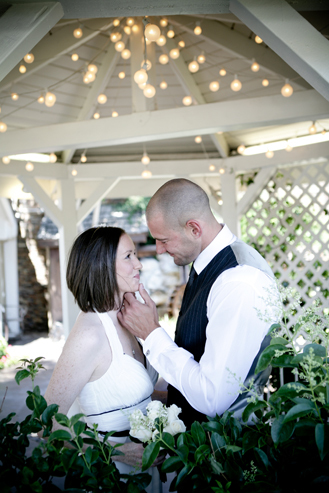 They had a lovely and relaxing wedding day, a definite plus point of the elopement! They chilled out in their hotel in the morning, had their wedding ceremony at 1pm, then returned to their hotel and had dinner at the Wolfgang Puck restaurant in the MGM casino. They loved the food there and it comes with their high recommendations! To top off their special day they went up the Eiffel Tower in the evening to see the strip all beautifully lit up. This entry was posted in Las Vegas, weddings and tagged Chapel of the Flowers, destination wedding, elopement, Las Vegas, Las Vegas chapel, Las Vegas Chapels, Las Vegas wedding, Las Vegas wedding chapel, Vegas elopement, wedding, wedding tips, weddings. Bookmark the permalink.